For many years I’ve been maintaining that if the Town of New Paltz had a white male hero associated with it of the historic significance of Sojourner Truth, a big statue of him would long ago have been plunked down right in the middle of Main Street. The great 19th-century orator and fighter for the emancipation of slaves never actually lived within the present-day town limits, but Truth did spend 16 years as a slave and bear her first five children on a farm in what was then called New Paltz Landing – now part of West Park in the Town of Esopus. She is known to have had supporters in New Paltz, including lawyers who worked pro bono on her successful effort to remand her son Peter from slavery in Alabama. It was also in the home of a New Paltz friend that she attended her first Methodist meeting, eventually choosing this denomination that encouraged singing, which she loved, over the more somber Quakers who had bought her out of slavery. In any case, though lacking a statue, New Paltz does have a park named after Sojourner Truth on the Wallkill riverfront, as well as the library on the SUNY-New Paltz campus. Corinne Nyquist, wife of longtime Village of New Paltz mayor Tom Nyquist and head librarian just about forever at the Sojourner Truth Library, has made it a sort of personal quest to pull together the bits of research about Truth’s life story that still continue to emerge – even since her “definitive” biography was written by Pulitzer Prizewinning historian Carleton Mabee (who is also the current Gardiner town historian) in 1993. The library’s website is now the go-to place for information that will enable Ulster County residents and visitors to walk in Truth’s footsteps on her long road to freedom for herself and her children. The woman we know today as Sojourner Truth was born Isabella Baumfree, probably in 1797, to a pair of slaves owned by colonel Johannes Hardenburgh. On the library website’s “On the Trail of Sojourner Truth” page, www2.newpaltz.edu/sojourner_truth, you can see a picture of Hardenburgh’s house. It’s still standing today in the rural hamlet of Rifton in the Town of Esopus, just a few miles north of New Paltz. “While Isabella was an infant, Johannes died and she and her parents became the property of his son, Charles. He ran a hotel and housed all his slaves in a damp basement. That building has not yet been located,” says the webpage, reflecting the hope that yet more mileposts on Truth’s historic journey still remain to be identified. A couple of exciting new Truthiana tidbits just emerged in the past few years, as the Kingston suburb of Port Ewen, on the Town of Esopus side of the Rondout Creek, made plans to demolish and rebuild its old Town Hall. The cultural survey required for the improvement of Route 9W disclosed that the Town Hall had been built on a plot that had belonged to one of Sojourner Truth’s former owners, Martinus Schryver. This discovery reawakened local interest in her history, and a stone house in nearby Ulster Park was recently identified as the tavern belonging to Schryver where Isabella worked (and by her own account, learned to swear) until about the age of 13. Again, you can see a photo of the building on the library website. Another interesting new addition to this great online historic resource is a map of the 11-mile route that the adult Isabella must have walked in 1826 with her infant daughter Sophia, fleeing the West Park home of her then-master John Dumont, who had reneged on his promise to free Isabella, her husband Tom and their children. Heading for Poppletown, where a community of Quaker families lived who opposed slavery, she presumably took what is now called Floyd Ackert Road – the steep uphill route used by modern-day hikers to access Scenic Hudson’s Shaupeneak Ridge Park and Louisa Pond. 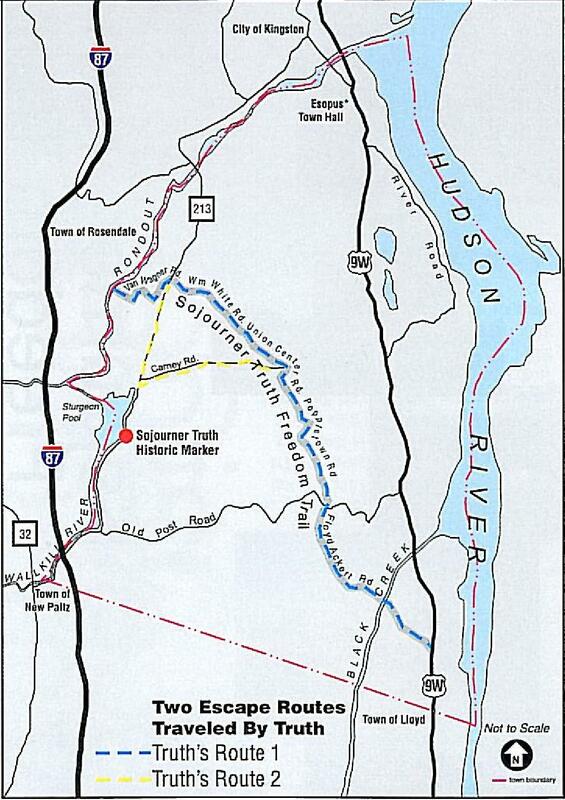 You can download the map, designed by former Esopus town historian Dorothy Dumond, directly at www2.newpaltz.edu/sojourner_truth/escapeRoute.jpg and retrace the great woman’s steps yourself – whether from the comfort of your own car, on a bike or afoot.